The enclosed gazebo offers incredible views of the lake and also can serve as an extra bedroom. A great location for honeymoons and anniversaries. The unique gazebo is built right into the cliff overlooking Lake Superior and is the seasonal 4th bedroom. The deck for the gazebo wraps around to the sides so you can take full advantage of this view. With a large, private ledgerock beach, Seacliff is sure to enchant. Sit on the deck outside the living room and listen to the waves crashing against the cliff. Seacliff is a 3 bedroom, 2 bathroom home on Lake Superior in Lutsen, MN. The large entryway is a great place to take off your boots and jackets in the winter. Enter into the living room with a stone-surround wood-burning fireplace. Comfortable furniture, a flat screen TV, and a large fireplace - what more could you want The living room also has great views from the sliding glass doors that lead onto a large deck. The galley style kitchen is well equipped for all of your cooking needs and opens up into the dining room. The full sized, well-equipped kitchen is a great place to prepare meals during your stay. The dining room seats 8 and has great Lake Superior views. The master bedroom has amazing Lake Superior views and a private wood-burning fireplace. Sleep in comfort in the queen bed in the master bedroom. Grab a seat in the window and read a great book while enjoy Lake Superior views. This huge master bathroom features a separate toilet area, a walk-in tiled shower, and a massive jetted soaker tub. Enjoy the massive dual vanity in the master bathroom. The deep soaker jetted tub in the master bathroom is great for relaxing after a long, active day on the Northshore. On either side of the jetted tub you will find the toilet and steam shower. The first guest bedroom has a queen bed and is located off of the living room. Curl up with a good book in the window seat. The second guest bedroom has a queen bed and is located near the kitchen. The four poster bed and window seat make this a popular bedroom. The guest bathroom features a classic clawfoot bathtub. Located in the hallway between the kitchen and the master bedroom, this bathroom serves as the main bathroom for the 2 guest bedroom and gazebo. The Gazebo bedroom is available May through October and is a guest favorite Climb down a flight of stairs from the main house and onto the gazebo deck. Inside you will find a queen bed with comfortable decor and an incredible view. Yes, a seriously incredible view out of the floor to ceiling windows that wrap around the entire gazebo. This beautiful gazebo is sure to impress with its unique design that allows you to take full advantage of the Lake Superior views. The stairs then lead down to the ledge rock beach below. Seacliff also boasts a large yard, great for kids and pets, but be careful. The cliffs edge is a short distance away. Enjoy the yard furniture to take in the Lake Superior sights and sounds. Seacliff includes firewood for enjoying fires in the living room or master bedroom fireplaces. You cannot find a more unique property with such a beautiful setting than Seacliff. This beautiful lakeside vacation home in Lutsen is one of our extraordinary romantic hideaways. Seacliff is located on the scenic shoreline of Lake Superior and this rental home has been the setting for many honeymoons and anniversaries as well as family getaways and friends weekends. Far from ordinary, this home is enchanting and unique - a North Shore favorite of many of our visitors who return year after year. Even our own marketing director, Hannah, wanted to share the Seacliff love by personally giving a tour of her favorite CVR home! Click here to check it out. Seacliff is a 3 bedroom, 2 bathroom, 1 story rental home featuring a spacious living area, bright and cheerful kitchen, master bedroom suite with a fireplace and incredible master bathroom. In addition there is an absolutely breathtaking seasonal gazebo bedroom, built right on the rocky shoreline. The bedrooms are so beautifully decorated you won’t be able to decide which one to use. Each comes with their own window seat, so be sure to bring your books. The spacious kitchen has a large dining table in front of the bay window to take in the view of Lake Superior. The circular driveway allows ample space for parking, perfect for boats and trailers. The seasonal gazebo offers an amazing 4th bedroom right on the edge of the lake for summer wave watching. Accessible by a flight of stairs, caution should be used with children and those with mobility issues, but once inside you will be greeted with 180-degree views of Lake Superior. 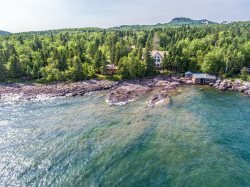 Down another flight of stairs, you will find yourself on a private ledge rock beach that offers amazing Lake Superior views and plenty of privacy. Sunbathe with a nice book in the summer months while listening to the waves crashing against the cliff's edge. You may never want to leave! NOTE: This property sleeps 8 guests in winter months (October 25th - May 15th), using the sleeper sofa and 8 guests in the summer with the gazebo being a sleeping option. The gazebo is only available May through October, as is the ledge rock beach. Seacliff is located just a few miles from the town of Lutsen and is located near many popular North Shore activities and attractions. Lutsen Mountains, a premier downhill ski resort in the winter and fun summertime recreation center with an alpine slide and sight-seeing gondola is just a few miles away. The Superior National at Lutsen Golf Course is also just a quick car ride away. Head up or down the shore and you will find miles of hiking, biking, snowmobiling, and cross-country ski trails. The area is also home to numerous state parks and waterfalls that are sure to enchant. The North Shore is also known for the many unique dining and shopping options! Try something new every day. You could stay for a month and still not experience it all. So become another returning guest and visit Seacliff year after year. It won't disappoint! Beautiful location, fantastic vistas and most relaxing.Clean and tidy, comfortable. Enjoyed the gazebo,with wonderful place for slumber and reading a book.The crashing of the waves were soothing to sleep by. Seacliff is a beautiful, spacious house. We enjoyed the views, all the glass, the gazebo (which we didn't use, but climbed down to, the better to see the gorgeous rocks). The well-equipped kitchen, the big bathroom w/ jacuzi and steam shower. The spacious closets. The comfortable living room. We stayed for two whole weeks, during which even the road off Hwy 61 was lined by a fantastic array of wildflowers. Loons. Eagles. Two white penguins. Lots of little spruce wrens. It was a Treat AND a RETREAT! Suggestions: a blender, a good sheet of instructions for using the DVD player (Bill from Cascade was VERY helplful in setting us up), and a toaster would be useful additions. This home is a great place to hang out and be with family! We stayed here for a long weekend and couldn't have asked for more comfortable relaxing setting! The gazebo was fantastic to sleep in. The moon was shining in, the waves were crashing and it felt like you were a part of nature and feeling the experience of Lake Superior! Thanks for sharing this wonderful place with us and we look forward to our next stay! We had a very enjoyable stay at the Seacliff home. This home was very clean and well equipped with all the amenities needed, including comfortable beds. We appreciated the tasteful decor and beautiful art pieces throughout the home. The location is very private, quiet and peaceful. Our favorite part of the property is the gazebo bedroom built on the cliff. It was a terrific place to relax and do some serious lake gazing. Most exciting for us was to watch the bald eagles soar by every morning and evening, while we were sitting at the dining table having breakfast and dinner. The lake views are fabulous, especially looking through the very clean windows! The home is well taken care of. The home is spacious and comfortable, with excellent amenities. It suited our group of five adults perfectly. Plenty of room for all to relax around the fireplace, enjoy cooking and eating meals together, and sleep without undue noise from others. Close location to skiing and snowshoeing was perfect. One suggestion, however, is to switch to fragrance free cleaning products, especially for linens. The products used in this home had very strong fragrances, which was very difficult for one of us dealing with respiratory congestion.